It is not a secret that we are all addicted to bread, the kind that is made with wheat flour – it has been a staple and a comfort to so many of us in many different cultures. If you do enough research on wheat, you will soon discover that even in its raw, sprouted form, it is much more of a culprit than a friend (wheatgrass is the exception). I’ve tried to cross the flour off my ingredient list numerous times before discovering raw food, and every attempt resulted in a struggle. This onion bread is very aromatic, and pairs well with green soup, salads, raw marinara, and cheese. Also, be sure to try mini sandwiches with raw sauerkraut and a slice of tomato on top. I took the main core of this recipe from a forum, but the idea of embedding the bread with seeds and herbs for garnish and flavour was my own. In a food processor, whirl onions, sunflower seeds, nama shoyu and olive oil until smooth. Add flax seeds and blend until thoroughly combined. 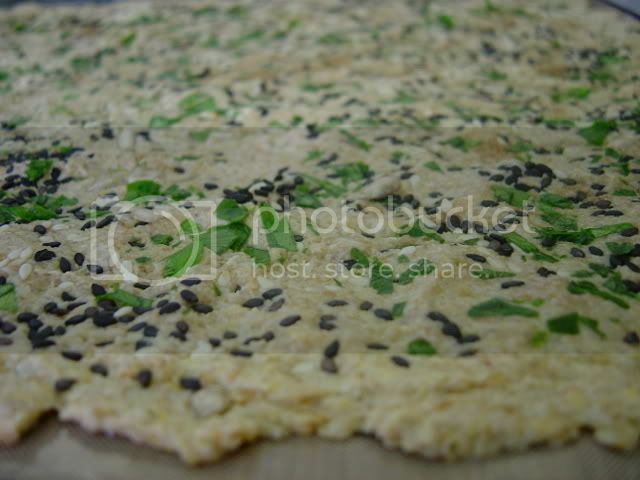 Spread on Teflex sheets, sprinkle with poppy seeds, brown/golden/both flax seeds, light/black/both raw sesame seeds, sunflower seeds, and minced parsley. With wet hands press all the garnishing ingredients into the batter. Dehydrate at 105F for 6 hours. 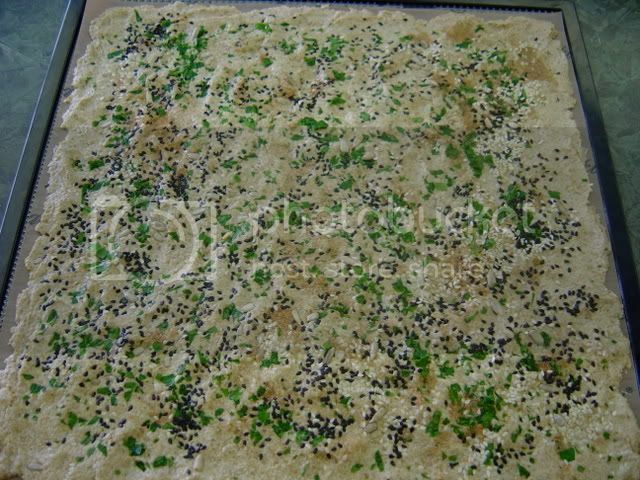 Flip, carefully peel the sheet away, and dehydrate for another couple of hours, until the batter is no longer sticky. Cut into crackers of desired size. 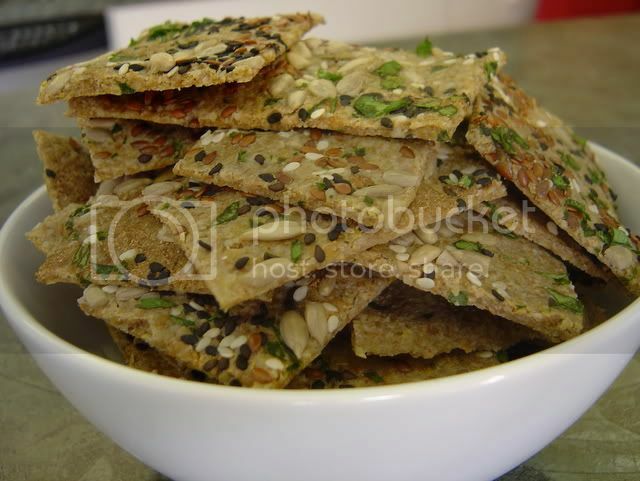 Return the pieces onto trays and dehydrate for a total of 18-24 hours. Keep refrigerated in air-tight glass containers. I’ve never tasted anything like this, the bread looks amazing! What kind of dehydrator do you suggest? They look so yummy! 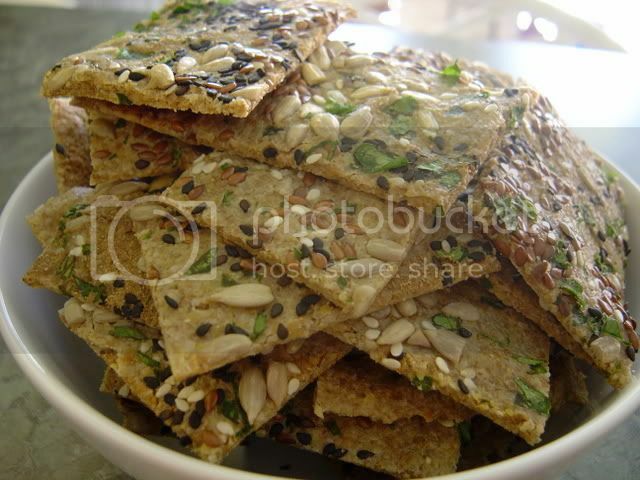 Would it be possible to use something else instead of the flax seeds in the recipe? I can not eat flax and it is so widely use in raw recipes… I would really appreciate if anyone could help suggesting any alternatives. Your work is fantastic and very inspiring, Golubka. thanks for sharing your wonderful treats. I just made this and it is AMAZING!! I actually thought the batter was really tasty before dehydrating too. Love how simple it is! Anon 7:52 – Thanks for your comment! Unfortunately, flax seeds are very difficult to substitute here. They act as a sort of glueing agent that sticks all the other ingredients together, that’s why it’s so widely used in raw cracker recipes. Sorry I’m not much help! Alex: So very happy you made and liked the bread! I agree, the batter is delicious on its own! Absolutely fantastic, just finished making them and they are GREAT!! How do you feel about Bragg’s Liquid Aminos instead of the Nama Shoyu? Would that work or be acceptable? Great recipe! Thank you for sharing it. I’ve been eating raw and living foods for almost a month and I started to miss the texture of bread and crackers. These were delicious! I am looking for a substitute for Nama Shoyu since we have soy allergies. Any suggestions? Can’t wait to try this. About how many onions (Med size) = 1/2 lb ?? Can not wait to make this !!! !